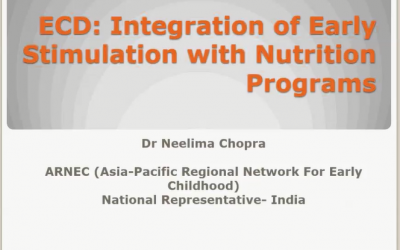 In this webinar organised by Sivangi Kaushik, Dr Neelima Chopra emphasises the importance of incorporating ECD (Early Childhood Development) into nutrition programming. Neelima, who holds a PhD in Education, works as a Faculty Member for Jamia Millia Islamia (university) in New Delhi and focuses on ECD (Early Childhood Education). In this webinar, she explains the significance of ECD and ECE and why we need to integrate early stimulation into nutrition programmes.